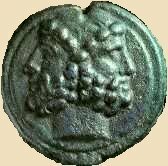 Janus was the Roman god of doors and gates. He looked to the past and to the future. This metaphor describes the role of our site - a door to the past and its people - and carrying the knowledge that we discover about them to the future. January and Janus represent new beginnings. New Year is my favorite holiday - a chance to clean up the last cycle and start a new one with a fresh renewal of energy. 02 JAN 2006 The Christmas Present of the Partitioned search engine that was given to guests who use the What's New Page is carried forward to this month. This will be available permanently but only to the serious Tri-County researchers who check the What's New on occasion. 03 JAN 2006 Mystery - Snow Caterpillars - This morning there are many dozens of caterpillars crawling around on the snow of my lawn - very slowly I might add. I have never seen this before and would like to know what they are. They are about 2 inches long. Can anyone identify them? Does anyone else have them? Update 8:45 AM - They are dying - no surprise there. I think because it has been warm they accidentally hatched and got the worst of it. Bad timing. 06 JAN 2006 1850 advertisement for Eagle Hotel (Troy) added to picture already on site. Friday the thirteenth got the reputation of being unlucky when the Knights Templar were rounded up and executed by a church inquisition in the middle ages on a Friday the thirteenth. It was indeed unlucky for them. To those of you who still think it is unlucky - get over it. 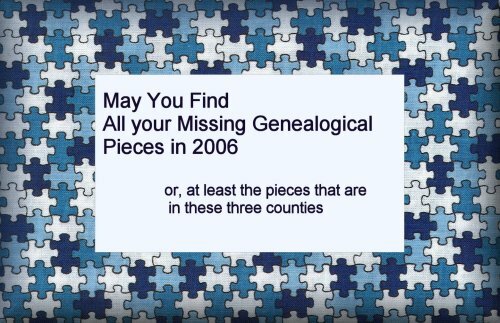 19 JAN 2006 Thursday, January 19th at 1:30 PM, Genealogy group will meet at the Bradford County Library at Burlington. 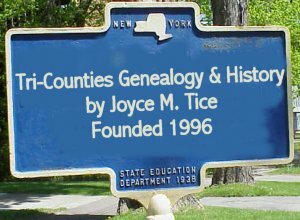 Meeting will be a working session with explanations and assistance with using Heritage Quest program (free program available at the library), and the Joyce M. Tice Tri-County website. The Chemung County Historical Society's Annual Meeting is coming up next Thursday, January 26th. The festivities begin at 12noon with a luncheon, followed by a brief business meeting to welcome our new Trustees, and then a program at 1:00pm. The cost is $14.00 per person. Please be sure to RSVP by Tuesday January 24th so that you can be included in this annual tradition. Last day of the January that wasn't. Where is winter??? 01 FEB 2006 The Christmas Present of the Partitioned search engine that was given to guests who use the What's New Page is carried forward to this month. This will be available permanently but only to the serious Tri-County researchers who check the What's New on occasion. 04 FEB 2006 I have introduced an even further subdivided version of the PICO search engine below. If you do not take the time to press the drop down list, you will not have a clue how this works. Here is the gift. It is up to you to use it. Don't assume this is just the same old PICO we have had for several years as many have told me they have assumed. Trust me, I would not disrespectfully waste your time asking you to look at something that is useless or not a major improvement. The number of Thank you notes I have received indicates that fewer than 1% of my guests have even looked at this or recognized its value. Don't make my time a waste by not looking at this useful new tool for the regular What's New users. This is presented in unfinished preview mode. I am pleased at your eagerness, but Please respect our time and generosity by not asking for more before it is complete. If I get too much mail, other than thank yous, on a preview item, I will hesitate to do it again and everyone will have to wait longer. The book WILL BE presented in its entirety. Please be patient and not impose pressure on us .We will not remove a single word of its content from our completed presentation. Don't make me regret showing this to you on a preview basis. If you want to say thanks, that is great, but please do not ask for more before it is even complete. Doing so only takes time my away from finishing the presentation. 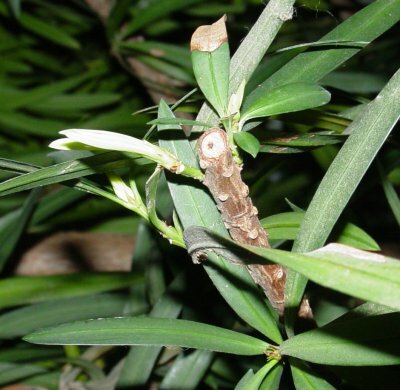 Joyce's monster Podocarpus announces Spring !!! One of the first signs of spring every year is the emergence of new growth on this enormous ceiling height houseplant of mine. Other people have their groundhog day, but I celebrate Podocarpus growth day. Cut is from the major surgery I performed last fall so I could move in the room where it resides. how it ties together with the first white explorer, Etienne Brule's journey to this region and the once great nation of "Carantouan." Twigg will also discuss her recently published article in the PA Archaeologist. The PowerPoint presentation lasts just over an hour with a question and answer session to follow. Her 49-page booklet called "Carantouan" will also be on sale for $5 for anyone interested. You can learn more about Twigg and her research about Spanish Hill by going to www.SpanishHill.com. 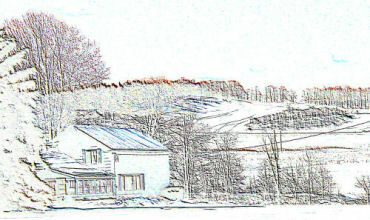 To learn more about the Susquehanna River Archaeological Center of Native Indian Studies (SRAC), go to www.SRACenter.com. 16 FEB 2006 Monthly Genealogy Meeting at Library - This month I (Pat SR) have just learned that Deb Twigg (info already on your What's New Page for Ashland Historical Society) will be presenting the info about Spanish Hill. This meeting will be Thursday, February 16, at 1:30 PM, at the Bradford County Library in Burlington, PA.
24 FEB 2006 Update on the Caterpillars - see 03 JAN item above on this page - Elmira Star Gazette 12 Feb issue identifies them as Large Yellow Underwing Cutworm (Noctua pronuba) , confirmed by Cornell entomologist Carolyn Klass. They were seen in this area in December and January. It eats roots, stems and leaves of grass. Judging by the grass damage in my lawn the last couple of years, it has been here a while. Then the skunks dig up the lawn looking for them. 26 FEB 2006 Potterville Postcards and Photos - This is the February installation of Kathy's pledge to send us something new every month. She is paid up to date. 01 MAR 2006 The Christmas Present of the Partitioned search engine that was given to guests who use the What's New Page is carried forward to this month. This will be available permanently but only to the serious Tri-County researchers who check the What's New on occasion. 02 MAR 2006 FINALLY we are having WINTER. Three weeks from the first day of Spring, Winter has finally made an appearance - enough snow to cover most of the grass at long last, wind, blowing snow, the whole thing. Wow!!! 09 MAR 2006 Eleanor LENT Wolfe reported Robins in the area two days ago, and some even saw them last month. They finally made it to my lawn this afternoon as well as geese going over heading north. STILL MORE historic Troy Houses added to bottom of existing page. AND I have more that I have not put there yet. Bill Bower on Barclay Mt., and Sara Millard, author: The Adventures of Sally on Barclay Mt. 18 MAR 2006 The Erin Historical Society will be sponsoring the 4th Annual Erin Irish Festival to be held on March 18th, 2006 in the Hamlet of Erin, New York; the Erin Historical Museum will be open from 10 AM until 4 PM. There will be a special display this year about past Churches and Religions of Erin, researched and set up by Pat Wainwright, the museum Curator/Librarian. The display, along with all of the wonderful artifacts, genealogy, and other information available, will prove to be most interesting. Several members of the society have been working hard at repairing, upgrading, and restoring the two rooms at the back of the museum, and of course, our restroom facility was finished last year. Rod Wainwright, Ed Masin, Eddie Rounds and Jim Cummings are among several in a group of folks, who have put in many hours, planning and working hard to make the museum more comfortable and presentable. You will be pleasantly surprised. There will be a wool spinning demonstration and display of articles made by Gretchen Ham; she will be at the museum from noon until 4 PM. Jim Brick will entertain in the AM with his accordion at the museum, and again later at the fire hall. The Erin Post Master, Linda Bennett will be on hand for a period of time in the morning and again in afternoon at the museum, to hand cancel your letters for you with Irish theme cancellation stamps (designed for the 2006, 4th Annual Irish Festival). Some of the postmarks/cachets are still available from previous years. Your friends and family will be delighted to get a special St. Patrick's Day commemoration in the mail from you; and, you collectors of such memorabilia, will want to be sure and get these for your personal collection. The Erin United Methodist Church will be open to the public as well; there will be a bake sale (and everyone knows how good the church women can bake), starting when the doors open at the church, until all the goodies are gone. There will be music and singing by Lynn Maki and others, participation by the Scouts who are sponsored by the church, as well as other things to entertain you. Stop in and visit with folks and have a cup of coffee or tea and a cookie. You will not want to miss the Corned Beef and/or Ham and Cabbage dinner, complete with beverage and dessert, being cooked & served by the Erin Fire Dept. Auxiliary; price will be advertised later; the dinner will be served from 11 AM until all is gone. The Let's Dance Studio - Celtic Dancers will perform their Irish Dancing at 1:30 PM at the Fire Hall; don't miss that! The entertainment is free. There will be other entertainment during the day as well at the fire hall. If you have questions, please feel free to call me (Suzanne Murphy) at 607-739-0242. We are looking forward to seeing and celebrating with all of you. Don't forget to wear your green and be on the outlook for the "wee people." 20 MAR 2006 First Day of Spring and we had no more than a day or two of winter at all. 1885 Bank Robbery at Osceola - An exciting account of a chase on foot and by horse wagon from Osceola to Elkland to Lawrenceville, Wells, Southport, Elmira, Big Flats - Manged to traverse all three of our counties and engage law enforcement personel in all. Addition to Troy marriage Page - Anna Tidd married to Dr. Mahlon Ballard 1895 and daughter Helen Ballard married 1923. Don't miss the other 117 of our centenarians - MANY still iving. 28 MAR 2006 Deb Twigg Presentation on Spanish Hill - Sayre Historical Society's Annual Dinner will be March 28th, 2006 at the Sons of Italy - I am honored to be the guest speaker this year and will be presenting the latest updates in "The Spanish Hill Story" to include my article being published by PA Archaeology and as usual try to give you a few laughs along the way! Tickets are $13.50 per person (includes tax and tip)and I can get them to you if you are interested in attending. Spring Peepers peeping in evening. It IS Spring.